Yesterday we presented you with A. Lange & Söhne’s SIHH debuts, today we turn to Richard Mille. The newest models include one men’s model and one for women. 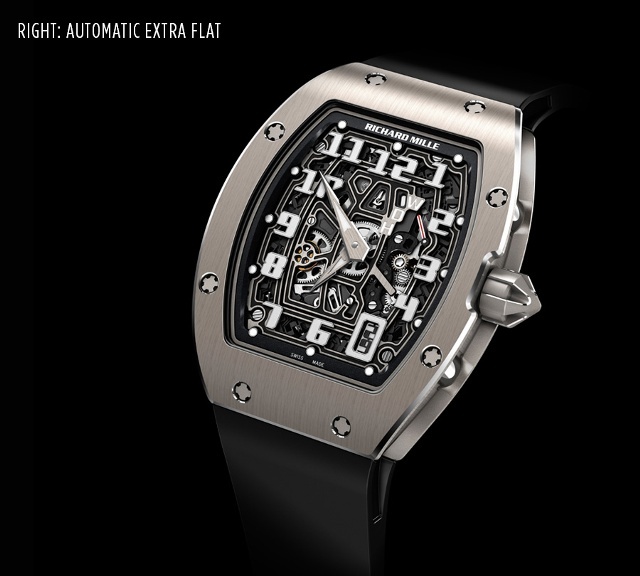 Below are descriptions of two new models and tune in to iW for more news about Richard Mille during SIHH all this week. The case of this new watch marks the first time that the Richard Mille tonneau shape has been created in an extra flat form. To create it, Richard Mille requires extra time: almost six hours of pure machining time, not counting weeks of preliminary preparation (including sixty-eight different stamping operations required just for the bezel, caseband and back bezel). Each case represents more than 215 separate machining operations. The automatic movement CRMA6 is a new caliber measuring only 3.6mm thick. It’s designed in house by Richard Mille’s engineers in Les Breuleux. At the heart of the movement’s design is the use of involute profiles (angled gears used in auto engines but rarely for timepieces) for the entire going train, instead of the standard cycloidal-shaped teeth normally found in watchmaking. Such teeth profiles allow for a more efficient transfer of energy through the going train. The new watch’s baseplate and bridges are made from titanium and finished with a gray and black electroplasma treatment. The rotor is platinum. From the back, you’ll see a large open-worked winding barrel, rotor, going train and automatic winding mechanism bridges. The numerals in this new model have been created from solid metal and mounted on two linked and rigid titanium rails attached directly to the movement. 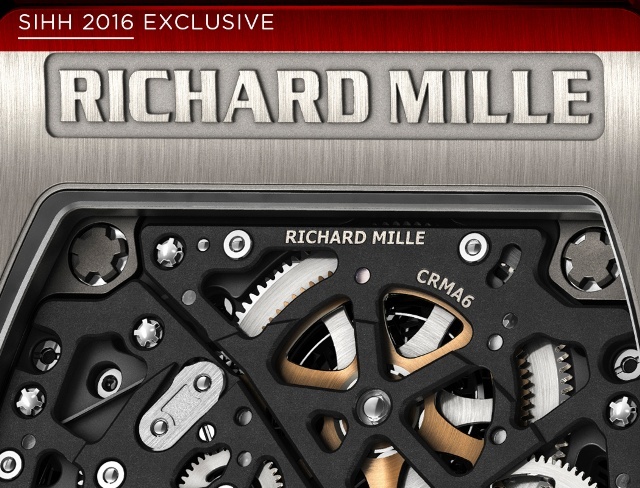 To increase the sensation of depth in this thin piece, each numeral has been sculpted out of solid metal and filled with a luminous substance - the first time Richard Mille has done this with a skeletonized model. The date window has been moved to the right side of the dial and is outlined with the same luminous material. Richard Mille debuts a women’s watch with all the complexities and technicalities generally associated with only men’s watches. 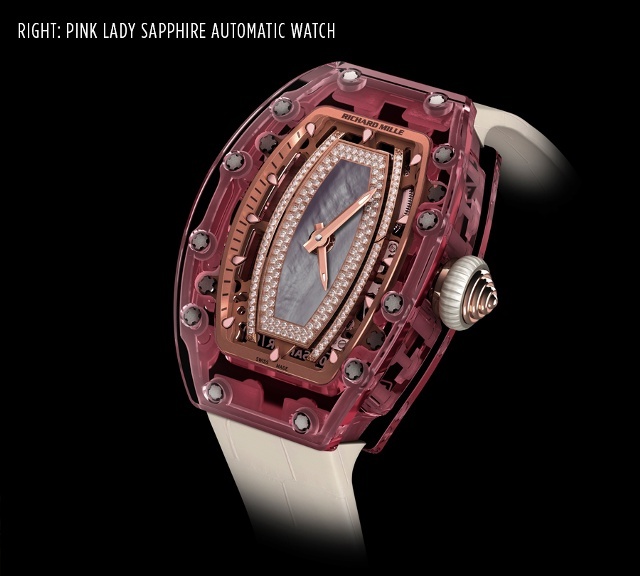 The RM 07-02 Pink Lady Sapphire Automatic Watch is powered by an automatic caliber protected by a pink sapphire case. The watch’s name was inspired by a 1930s drink called a Pink Lady, a gin-based cocktail introduced in response to boy’s club cocktails like an Old Fashioned or a Whiskey Sour. of manufacturing and testing to meet the watchmaker’s specifications—which in part explains the price ($980,000). Beneath the pink exterior, the original tripartite case reveals the automatic movement. The new in-house CRMA5 caliber is assembled around a skeletonized plate in micro-blasted gold set with diamonds. The same gold is used for the flange and the bridges, whose hand-chamfered and hand-drawn angles and edges capture light at the caliber’s heart. For full coverage on all things SIHH, visit our event page.